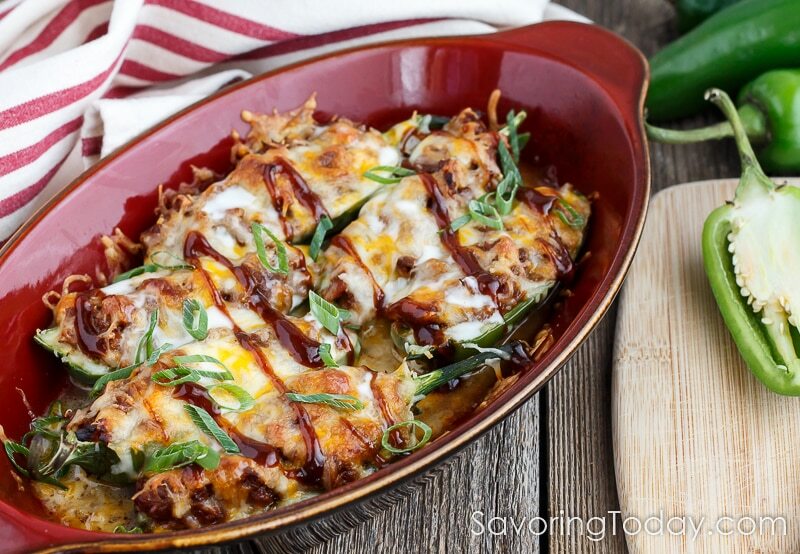 We’ve enjoyed this BBQ Pulled Pork Stuffed Jalapenos Recipe for appetizers, lunches, and even put an egg on top for breakfast. Oh yes, I said breakfast! With any luck, you’ve already got leftover pulled pork just waiting to create some magic beyond the bun. If not, here’s a Grilled BBQ Pulled Pork Recipe well worth diving into. First, you’ll want to select fresh jalapenos with some heat so there is a nice contrast in flavor with the pulled pork and cheese. Did you know not all jalapenos are hot? It’s true. I’ve been disappointed more than once expecting a nice zing from my jalapeno popper and then … no tingling on my tongue, no highlight of heat, nadda. (This is where I sadly push the sour cream aside.) And then there’s the pepper that is so hot it burns all the way through. That’s when you start thinking mild has its advantages. A number of factors determine how hot the chile peppers get, like the variety and growing conditions—amount of water, ambient temperature, stress, and fertilizer used. It is interesting to note how even these variables are not necessarily consistent everywhere. In an article from the UC Division of Agriculture and Natural Resources, the restriction of water to induce stress hasn’t worked to produce a hotter chile pepper for them, but nitrogen levels look promising. Unfortunately, we do not know the cultivar or growing conditions at the market, so we guess. Fresh jalapeno peppers range between 2,500 and 10,000 Scoville units, which is somewhere between a hotter Anaheim and a milder Serano. The tricky part is knowing (or making a strong guess) as to which one is which. While there is no guarantee, I found the following guide to be more accurate than guessing. Color: Fresh jalapenos range in color from light green (younger) to deep green to red (matured). The younger peppers are a lighter shade of green and likely more mild compared to darker green or red (red is harder to find in grocery stores). The photo above is an example of the various shades of green. Texture: Younger peppers also have a smooth skin, as shown in the pepper on the left. Older, hotter jalapenos will have tan markings called corking on the surface, appearing like stretch marks. 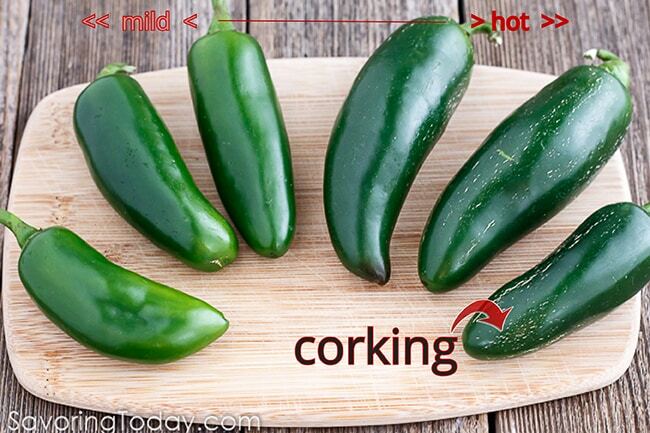 In the photo, this corking is evident on the dark green jalapeno on the right. Age: Both the color and texture of the skin are indicators of a more mature, hotter jalapeno. I tasted each of the peppers in the photo to test the above color and texture guide. On a scale from 1 to 10—from mild to hot—the jalapeno on the left (light green, smooth skin) was rated a 2, with a mild and bright flavor. The jalapeno on the right was rated a 9, with deep earthy heat that lingered. 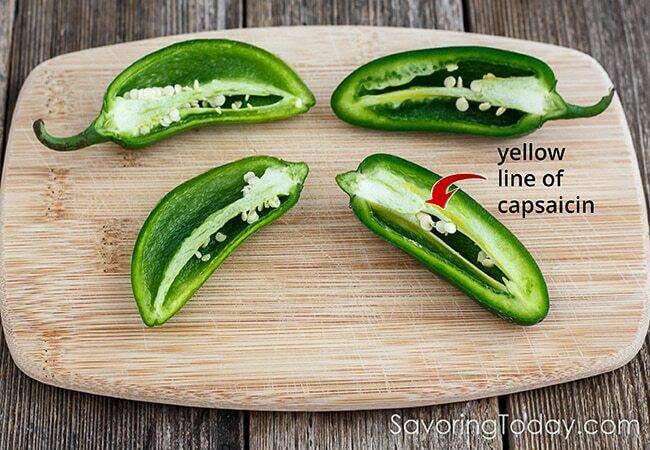 Even though it’s not a guarantee, I will use this guide when selecting jalapenos for recipes in the future. The only sure way to truly know how hot a chile pepper will be is to actually taste it. However, don’t go chomping off the end if you’re a novice at this whole hot chile pepper game. The peppers in the photo below are the same chiles from the photo above—respectively, the two extremes from left to right. Notice the differences on the inside too; see more details in the tasting guide below. ⇒ Always wear food prep gloves when handling hot peppers and never touch your face or eyes while doing so. Slice the pepper lengthwise. Notice the pith and rib the seeds clings to inside the pepper. Go ahead and discard the seeds since no one enjoys the texture and the real heat is in the rib. Check the rib for a yellow line. The darker the line, the hotter it is. Unless you are used to eating incredibly hot raw peppers, don’t put it on your tongue—just trust me, this is the fire pit of the pepper. Taste the flesh of the pepper first. This will still have some heat to it but will be mild compared to the rib or yellow line of capsaicin. Depending on your impression of the green flesh, sample a tiny bit of the white rib (again, stay away from the yellow line) to determine if it belongs in your recipe. 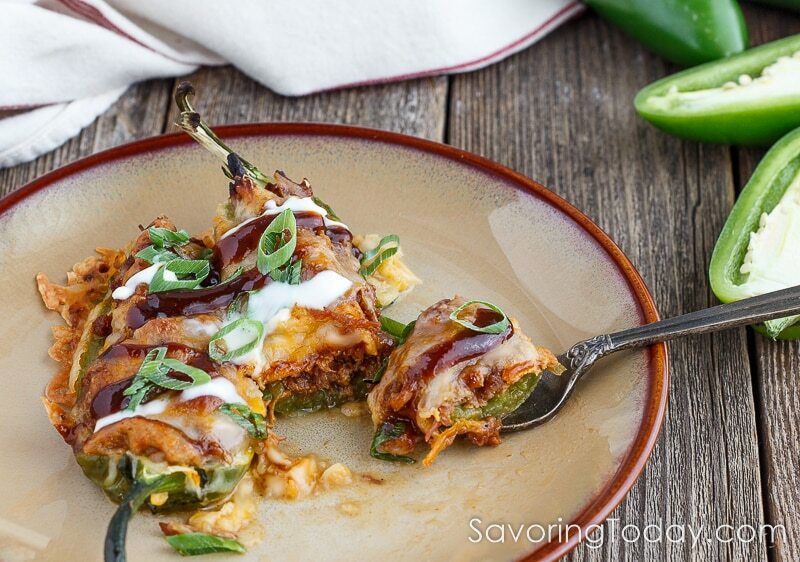 BBQ Pulled Pork Stuffed Jalapenos is the easy kind of appetizer you need so there’s energy for the rest of your party plans. 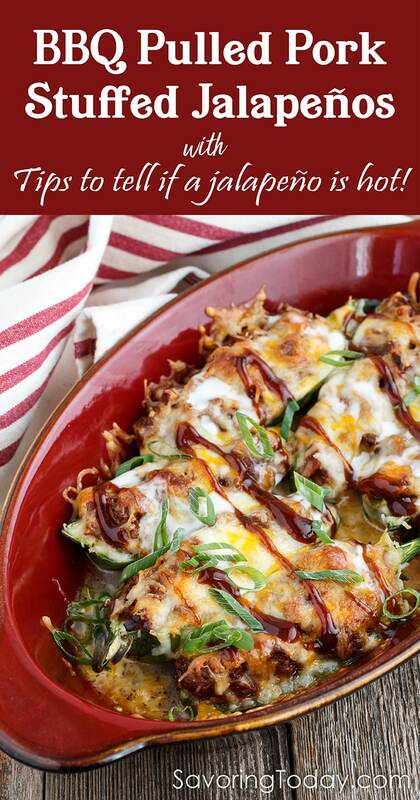 BBQ Pulled Pork Stuffed Jalapenos are a great party appetizer or snack! Heat oven to 375° degrees. *Wear gloves to handle jalapenos. Using a sharp knife, slice peppers lengthwise through the center to create two halves. Discard the seeds. Depending on how hot you prefer the dish to be, either leave the white rib inside the pepper intact for more spicy-heat, or remove and discard before stuffing. Mix the pulled pork with enough barbecue sauce to lightly coat the pork, or as you prefer it. Fill each half of the peppers with approximately 2 tablespoons of the pulled pork (this will depend on the size of the peppers) and place in a greased baking dish. A 9x11-inch dish is usually big enough, depending on the size of the peppers. Repeat until all the peppers are stuffed. Pour 2 tablespoons of water in the bottom of the dish, under the peppers. Top with cheese and bake for 25 to 30 minutes, until cheese is browned and bubbly. Serve with sour cream and extra barbecue sauce at the table for garnish. Serving Ideas: Serve as an appetizer, with a salad for a light meal, or with an over-easy egg on top for breakfast. NOTE: The recipe can be prepared and refrigerated until ready to bake. If made ahead in glass bakeware, remember to bring to room temperature before placing in a hot oven. This looks so delicious, such a great way to use up leftover pulled pork! Have never seen them stuffed with pulled pork before and they sure look good. I think you might easily be starting a fad here. I’m in! This looks amazing!! Pinning and sharing. I don’t eat jalapenos but hubby loves them. I made these for him tonight. He loved ’em! Said he will definitely want to have those again sometime soon. He also appreciated that I used your tips to find peppers that were less spicy. He likes a nice spicy pepper to slice or dice and add to burgers or tacos. But to eat this much pepper, he said mild was definitely better. Thanks for the recipe and the tips! Oh! Here’s a tip of my own: I used grated cheese and it just kept falling off. Small slices of cheese might have done better for me. Hey, thanks for stopping by to let me know you like this dish! I’m so delighted that the tips helped you select just the right peppers for your hubby to enjoy. 🙂 I know what you mean about the grated cheese, though we are always happy when there’s browned cheese on the bottom of the pan (yum!). You’re right about using sliced cheese to keep it all in place — good tip. AND when you make it again, be sure there’s enough for leftovers — a sunny-side-up egg on top is not to be missed! This looks great. I love the pepper tips. I don’t have a lot of experience with them at all. This looks so good! I love the flavor combo in this. Thanks for taking the time to stop by and say so!